My own recipe to use up that glut of tomatoes! This tomato soup recipe is gluten free, vegetarian and vegan. Cut the tomatoes into 8 pieces; remove the hard bit from the top. Peel and cut the onions and carrots into small chunks. Heat the olive oil and gently fry the tomato puree for around 1 minute. Add the crushed garlic, onions and carrots. Fry for another 5 minutes or until the onion has softened. Add the tomatoes, thyme, stock cubes, sugar and boiling water and cook for around 15 minutes. Serve hot or cold with the chopped parsley on top. 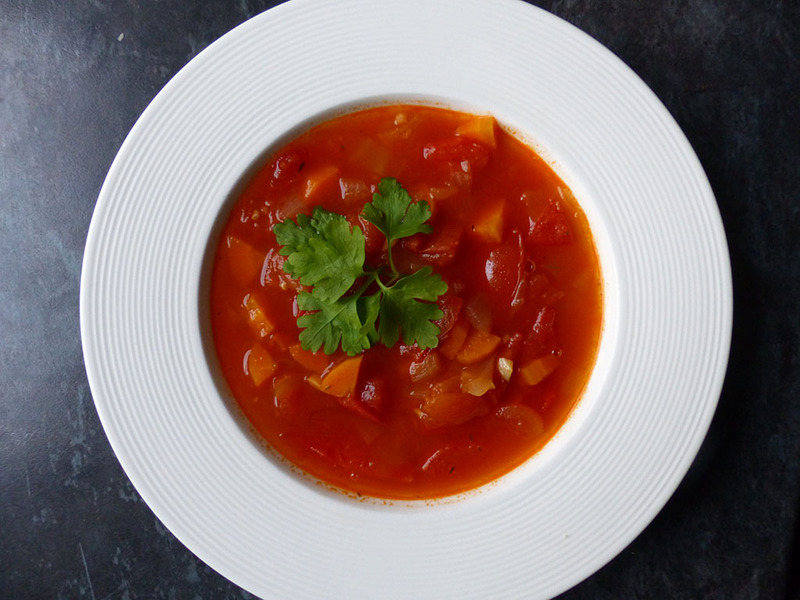 Top tip: If you grow your own tomatoes and have a glut, this soup freezes really well, so you can still enjoy it during the cold winter months!